Light refreshments will be served. This event is on the record and open to the media. 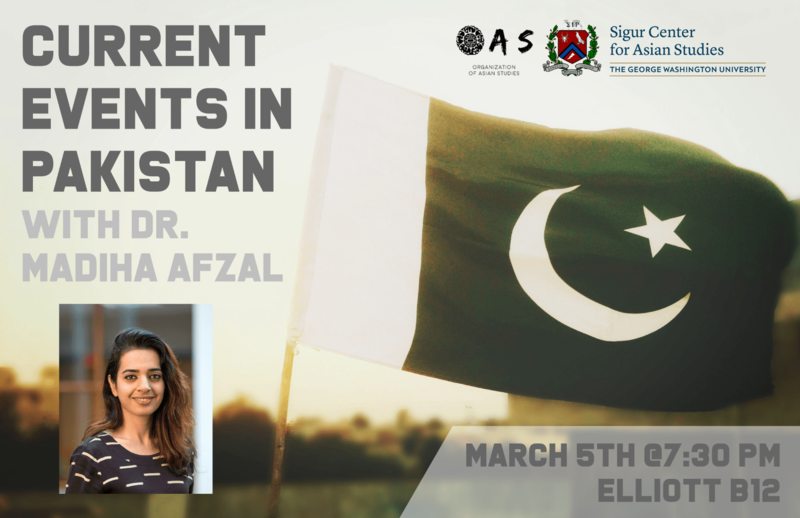 Join Sigma Iota Rho, the Organization for Asian Studies and the Sigur Center for Asian Studies as we discuss US-Pakistan relations and current events in Pakistan with Dr. Madiha Afzal, Visiting Fellow for Foreign Policy, Global Economy and Development at Brookings. We will also be discussing Dr. Afzal’s latest book, Pakistan Under Seige: Extremism, Society and the State. Join us on March 5th at 7:30 pm in 1957 E Street room B12. A small reception will follow. Madiha Afzal is a visiting fellow in the Foreign Policy and Global Economy and Development program at Brookings. Her research lies at the intersection of development, security, and political economy, with a focus on Pakistan. She previously worked as an assistant professor of Public Policy at the University of Maryland, College Park.